The Champagne is on ice after Albion's influential winger Anthony Knockaert again starred. Here's six things we learned from Brighton's 2-0 victory at Wolverhampton Wanderers. Albion's winger showed why he was named the EFL Championship player of the season with another impressive display. The Seagulls' influential Frenchman had already caused problems for the home side's defence before he took advantage of an error at the back to give Brighton the lead on the stroke of half-time. Wolves' defender Kortney Hause missed his clearance, which allowed Knockaert to break forward and drill home his 14th goal of the season, although the hosts keeper, Andy Lonergan, should have done better. Knockaert then jumped over the advertising hoarding to celebrate with the near 3,000 Albion fans who made the trip to Molineux. He then sealed all three points late on, when he slid the ball under Lonergan after Albion broke forward quickly to cap an impressive Albion display. Make no mistake, this is a special team the Albion have and they will go down in folklore when (not if!) they become only the second squad to take the club into the top flight of English football. All over the pitch today, Brighton won their individual battles and it was a fairly routine win. Wolves had a couple of chances in the second half but Albion always looked in control and are now just three points - four mathematically - from reaching the Premier League. It was almost an unwanted hat-trick for Seagulls defender Lewis Dunk. The 25-year-old had gone off through illness in the previous two games against Birmingham and Queens Park Rangers and then suffered a painful-looking foot injury when he clashed with Wolves' Jon Dadi Bodvarsson when looking to sweep the ball goalwards. Luckily for Brighton fans, Dunk was able to continue as the Seagulls kept a 21st clean sheet of the season. The Wolves faithful really got behind their side and produced an excellent atmosphere in the early stages. Their team had won five successive matches, before a 3-1 defeat to Bristol City last weekend. That run has sealed their place in the Championship for another season and their fans were expecting another strong showing against a Seagulls side pushing for promotion. The longer the game went on, the more frustrated the home fans got. The hosts had just one shot in the first half - compared to Albion's seven - and a succession of defensive mistakes led to a number of groans. By the second half, it was the Albion fans who could be heard the loudest as the Seagulls moved ever closer to the Premier League. Dale Stephens was outstanding in the middle of the park for Albion. He controlled the game throughout, spraying the ball around and winning all his challenges. 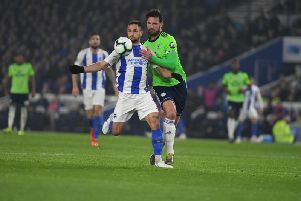 One of the first pieces of business Albion will look to do when they reach the Premier League will be to tie down the 27-year-old on a new contract. If he goes, he certainly won't be easy to find a replacement for. Alongside Stephens, Steve Sidwell was also excellent as Albion were in control for much of the game. 'We're going to win the league' sang the Albion fans after Knockaert made it 2-0. Victories in the final four league games of the season will clinch the Championship title. While promotion is the main goal for the Seagulls, there's no doubt the title would put the cherry on top of the cake. This is a special time for Brighton fans, who are loving every minute of an outstanding season. Huddersfield's late winner at home to Preston today just means the Albion might have to wait a little longer unti promotion is confirmed on Monday.